Let the grilling season begin! As soon as the weather breaks we are dusting off the grill and putting it to good use. My husband is the grill master of the family. Anything he throws on there comes out lip-smacking good and I can never get enough. It allows for me to prop my feet up and relax while someone else cooks for a change, which is why I love grilling in the summertime. While browsing in my local Food Lion store I came across SmithfieldⓇ Hickory Smoked Brown Sugar Marinated Pork Chops and just knew it was what we needed to grill up this Memorial Day weekend. 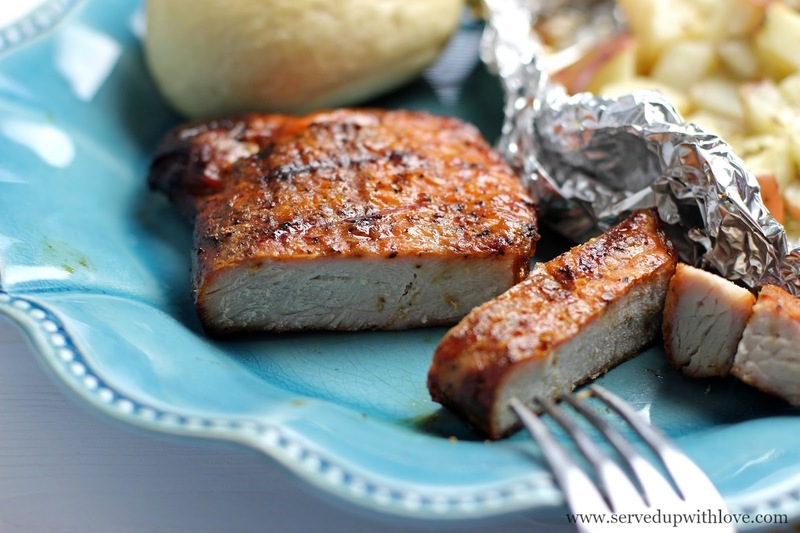 Plus, there is a $1.00 off coupon for Smithfield Marinated Fresh Pork so it was a win-win in my book. 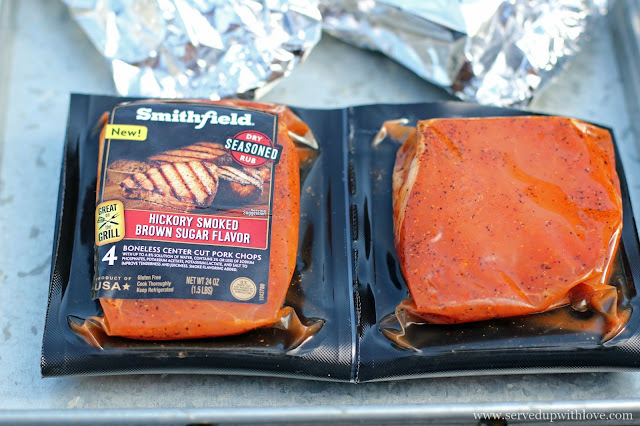 Smithfield Marinated Fresh Pork is slow-marinated and perfectly seasoned right in the bag, so no need to worry with marinating in enough time to grill it. If you are anything like me, this is a lifesaver! You can enjoy Real Flavor, Real Fast and spend less time preparing and more time relaxing on the patio. Its made from 100% fresh pork and has no artificial ingredients, you just got to love that. If only you could smell these babies cooking! 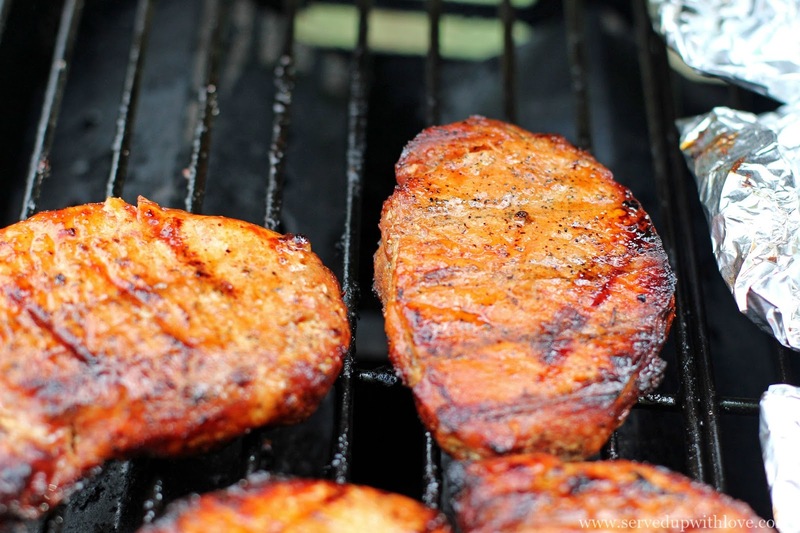 We could have made these Smithfield Grilled Hickory Smoked Brown Sugar Marinated Fresh Pork Chops into something totally different but with something this good, why change it. They were super flavorful and so tender. The knife cut through it like butter! Side dishes tend to be quick, easy, and simple when it comes to grilling. Usually I make the sides while my husband is manning the grill. We like to tag team like that. This time though, I decided he needed to cook it all. I did prepare the potato packets but other than that, he grilled it all. We went with the trusty potato as a side. 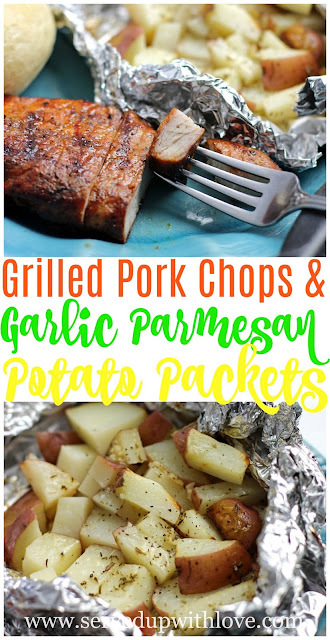 Garlic, Parmesan cheese, and potatoes go so well together and worked very well in these grilled potato packets. 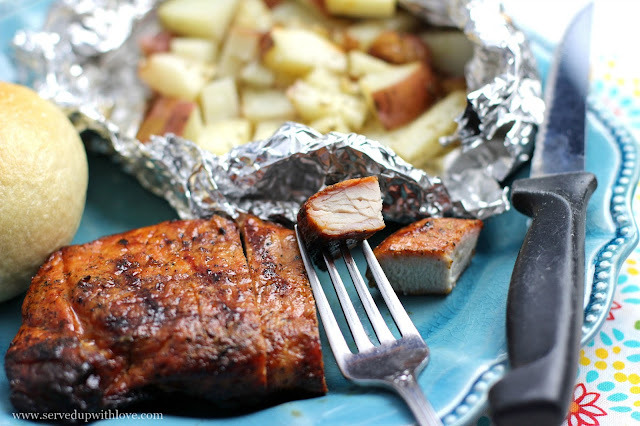 Between these delicious pork chops and those potatoes, our bellies were full. One last thing before you go. 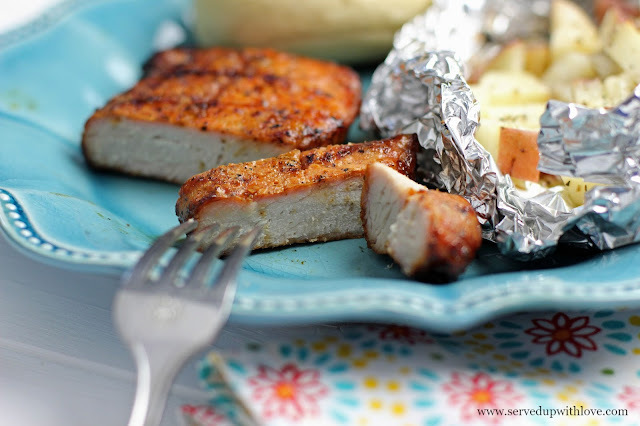 Do you have a tip to get dinner on the table in 30 minutes or less? Head to Smithfield Real Flavor Real Fast to enter the “What Can you do with 30?” sweepstakes for a chance to win a trip to Napa Valley. Doesn't that sound like fun? 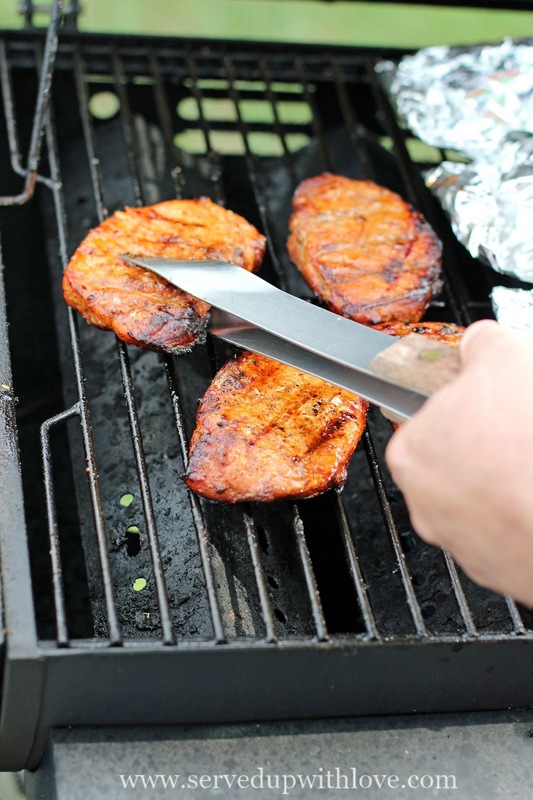 I would love to know, what is your favorite food to throw on the grill in the summer? Heat charcoal or gas grill to medium. Cook chops 7-9 minutes per side. Cook to an internal temperature of 160 degrees when measured in the thickest part of the meat. You will need 4 sheets of nonstick aluminum foil squares to make the packets. On each of the four squares, divide up the cubed potatoes and place a tbsp. of butter on top. Evenly sprinkle minced garlic over each of the four servings. Squeeze half a lemon over each of the four packets (one 1/2 lemon for all) Sprinkle grated Parmesan cheese and Italian seasoning over each packet. 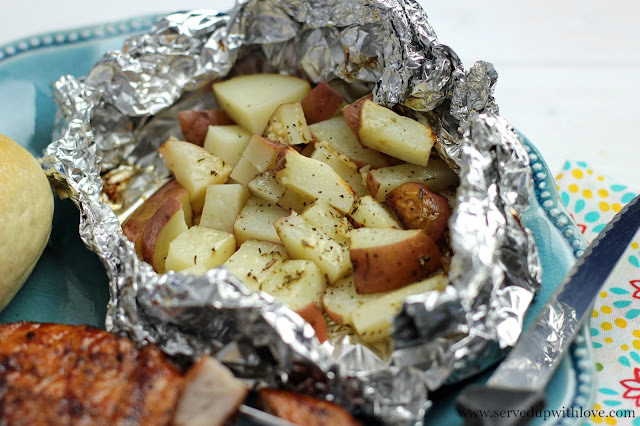 Fold up the sides and top and place on the grill for about 25 minutes or until fork tender. Careful opening the packets when done, steam is going to come out of these fast.